kũay tĩaw pèt : egg noodle soup with braised duck, in a sweet and salty broth. Last edited by Erik M. on September 8th, 2006, 5:02 pm, edited 4 times in total. 2. "sum lee dad deaw" : salted and dried butterfish, deep-fried and served with mango salad and spicy dip. highly recommended. 3. "puffy catfish" : known to many LTHers as "exploded catfish salad." 4. "clam with chile paste"
5. "duck salad" : although the version picture-linked above was made with the meat from a roasted duck leg, standard service entails a thinly-sliced roasted duck breast. a beautiful presentation. highly recommended. 6. "crispy on choy" : tempura-battered/fried water spinach, topped with minced chicken, poached shrimp, and mint leaves. highly recommended. 7. 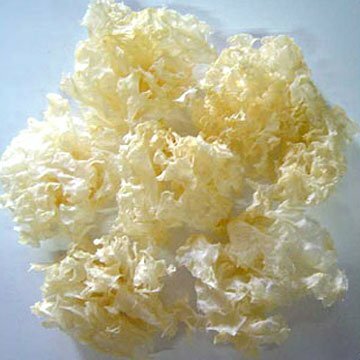 "mouse ear mushroom" : reconstituted white fungus salad with minced chicken, poached shrimp, lime juice, and chile. highly recommended. I've had some really outstanding meals at TAC Quick recently. This restaurant has always had good food, but the recent specials have been extraordinary. Last nite for example, we enjoyed Puffed Catfish,Duck salad, Crispy On Choy ,mouse ear mushrooms and Clams with Chile jam from the specials menu, along with Thai fried chicken, moo ping and Issan sausages from the regular listings. Everything was excellent but the specials were spectacular (the clams may have been the weakest). I was at Lotus of Siam last week and feel TAC compared very favorably , my wife actually thought our meal at TAC was better. Thanks E.M.. Fantastic. I can only think that giving a larger group access to the "real" menu gives places like this a chance to improve dishes that might not get nearly as much mileage. In that sense, you're doing everyone a favor. Thank you! A few weeks ago, on a particularly slow weekend night, I sat down with a couple of the waitresses at TAC to compile a "dream list" of special offerings. It was meant in fun, really, and Andy sat nearby and seemed perfectly happy to play along. But, as it turned out, and much to our surprise, Andy wasn't playing at all: much of what you are seeing now was first suggested on that night. IMO, if Andy continues to mine that original list of suggestions, then the best is yet to come. I will need to keep an eye on the specials over the next few months then. Something to look foreward to. By the way, it's probably worth mentioning that this is a byob spot and that the Sheridan L Liquor store just a few doors north has a very good selection of imported and domestic beers (including many not commonly seen). They also have wines, but wine and Thai food never really made sense to me. Yesterday I wrote: IMO, if Andy continues to mine that original list of suggestions, then the best is yet to come. For the preparation of this dish, short lengths of bone-in pork rib are first seasoned with a souring agent, and then "conditioned" in the refrigerator for a couple of days before eventually being deep-fried. Similar in profile to both the Northeastern Thai-style sour pork sausage, sâi kràwk isãan, and the Northern Thai-style raw-cured pork sausage, nãem, this item is likewise served with an assortment of palate cleansing garnishes. * I first encountered this item in Los Angeles last year, and wrote about it, here. You will find it listed on the specials board at TAC as "nam pork ribs." ** As I've said before, there is within the traditional Thai culinary repetoire an entire class of foodstuffs which are specifically intended to accompany alcoholic beverages. These foodstuffs are generally assertive in character, and as such, they are believed to hold up best to the dulling affects of alcohol on the palate. Last edited by Erik M. on September 11th, 2006, 12:59 pm, edited 1 time in total. I'm curious-- were they mostly things you had had elsewhere, or mostly things you'd read about and wanted to try? Mike G wrote: I'm curious-- were they mostly things you had had elsewhere, or mostly things you'd read about and wanted to try? Well, in my case, at least, it was some combination of the two: I proposed things that I'd previously tried in Thai homes, or in Los Angeles, or in Thailand, and I also proposed things that I'd only seen, or heard about, or read about. 1. Plaa sãmlii tàet dìaw (Southern Thai-style fried Butterfish with chile dipping sauce) was something that Andy and I first talked about over a year ago but I'd otherwise only read about. 3. Yam hèt hũu nũu (“mouse ear” mushroom salad) was something that I'd originally tried in Thailand and felt was often done poorly in Chicago. * And, at least one, if not both, of my waitress friends had tried it previously in Thailand. ** Truth be told, and as I've mentioned--howsoever obliquely--before, it is otherwise available in Chicago, but not to the retail public. So, loving it as I do, I really, really wanted this one to see the light of day. Tonight's Check, Please! episode was a testament to everything Erik M. stood for, and more importantly, got up and did for us. I doff my cap, and savor my miang kham and en choy at TAC and every other Thai place with a secret menu around the city. This Singha's for you. I'd argue that the Mouse Ear salad at TAC is one of their weaker dishes. So Santander, can you talk a bit about the episode? Santander wrote: Tonight's Check, Please! episode was a testament to everything Erik M. stood for, and more importantly, got up and did for us. I doff my cap, and savor my miang kham and en choy at TAC and every other Thai place with a secret menu around the city. This Singha's for you. For those who want to see for themselves, this episode of Check, Please!--featuring TAC Quick (and many mentions of "the secret menu"), the Signature Room, and Honky Tonk BBQ--will be repeated on Channel 11 at 4:30 pm Saturday 10/18 and 10:00 pm Sunday 10/19. Santander wrote: ...TAC and every other Thai place with a secret menu around the city. This Singha's for you. To extend the point made by the Pilsen resident on the show, it's really a shame that we have to consider these menus "secret". To paraphrase her: If they call themselves the most authentic Thai restaurant, then why do they keep all their authentic dishes a secret? Erik did a great thing in translating these menus and he went a step further in encouraging the restaurants to serve these dishes to non-Thai. It is my distinct wish that TAC, among other Thai restaurants, will finally come to the point of simply publishing these items (or at least a subset of them) at least under an "Authentic Thai Dishes" section of their menu, skipping the step of forcing people to ask for a menu they might not know exists. (Spoon has taken at least one small step in this direction). There's no reason that this food needs to be treated as if you have to be in some kind of special club to eat it. The more it's out in the open, the more people will enjoy it, and the more of it there will be. eatchicago wrote: To extend the point made by the Pilsen resident on the show, it's really a shame that we have to consider these menus "secret". To paraphrase her: If they call themselves the most authentic Thai restaurant, then why do they keep all their authentic dishes a secret? Well put and I completely agree. One of my most frequent complaints about ethnic restaurants is that they so often, and unnecessarily, dumb down the menu and/or flavors of dishes, trying to please a customer who couldn't distinguish pad thai from chow mein. It's time for them to realize that people are willing to expand their palates. Luckily, TAC is about to become inundated with "secret menu" customers, to the point where there might even be a run on preserved eggs. And every time I send a friend of mine to Spoon or TAC, I have to tell them to stay away from pad thai and the similar (which they really do no better than any run-of-the-mill Thai restaurant) and to focus on the dishes from the translated menus which really set Spoon Thai, TAC Quick, Sticky Rice and Rosded apart from so many. What surprised me the most about the Check Please episode though was Alpana's comment that she just found out about these "secret" menus. I figured someone so involved in the food industry would have known about that long ago. First, let me start by saying that Tac Quick is probably my favorite restaurant in the entire city of Chicago. With that said, I personally believe that there's a large population of culturally ignorant people in my neck of the woods (lincoln park/lakeview), that would literally run from any restaurant that had preserved eggs and fish cakes listed anywhere on their main menu. Tac Quick needs to highlight their "Americanized" dishes because (unfortunately) that's what the majority of people in the area want, and they'd probably go out of business otherwise. I seriously doubt that the mere presence of a challenging item on a menu would drive away their customers. Lao Sze Chuan, arguably one of the most successful Chinese restaurants in town, manages to have a menu that has both "sweet and sour chicken" and "sour pickle and pork lung soup". All types of dinners feast happily from all portions of the menu (although it may take a little coaxing of your waitress to get the exact dish you want). eatchicago wrote: All types of dinners feast happily from all portions of the menu (although it may take a little coaxing of your waitress to get the exact dish you want). Well, at least the translated parts of the menu, and everyone mostly pays the same price for this feast. Generally. Seriously, LSC does better than 99% of the Chinese and Thai places in the city, stocking and serving a huge variety of fresh ingredients from every part of the vegetable and animal kingdom (and every anatomical part of the vegetables and animals), and offering them straight up in menu vernacular. That's why it's an Ur-GNR and my go-to for celebrations of all types. But it's not a totally unassailable bastion of culinary ecumenism - compare the Hot Pot menu (if you can find it) in Chinese and English, or ask Tony if he's ever made anything special for the visiting businessmen he hosts. I've had many "secret" things even at our beloved LSC, one of the reasons my hopes to eat everything on the menu this calendar year became quickly daunting and untenable (combined with my life events and his opening of two other restaurants). I totally agree that happier diners, prouder staff, and fresher ingredients would result from the abolishing of all secret menus. I'm glad more places are headed in this direction, and LTH is a huge part of it. Educated diners are better diners (and happier stomachs). But it's true that one hangup from the restauranteurs' perspective is wasted ingredients. China and Thailand spawned two cultures (among many, including Western Europe, once upon a time) that use every part of the plant and animal, and abhor waste. Enlightened though the members of this forum may be, there are many out there that send "funky" dishes back to the kitchen after the first bite, or let their kids order and then not eat 'ridiculous' things for shock value, or even walk out of a place with "pork cookies," offal, or blood soups on the menu. I've seen it happen personally. Business is business, and it makes perfect sense to me that these places are setting their menus up locally the way that they are. * Now, I don't like it - but it does make sense. How lucky we LTHers are to live in an age of interconnected knowledge, and a most friendly city, so that we can engage and respect the pride and passion of our hosts and chefs, filling our bellies with the rewards. Sometimes, these rewards even make the translated menus for Joe Sixpack. *an example of the reverse: Casa de Samuel offers rattlesnake on the menu, and then is out of it half the time, or people complain about it being dried out from too long in the freezer when they do have it. It's a balancing act with little reward for the restauranteur. eatchicago wrote: First, let me start by saying that Tac Quick is probably my favorite restaurant in the entire city of Chicago. With that said, I personally believe that there's a large population of culturally ignorant people in my neck of the woods (lincoln park/lakeview), that would literally run from any restaurant that had preserved eggs and fish cakes listed anywhere on their main menu. I've been to TAC a least a dozen times and the only time I've ever seen a table besides my own order off the secret menu--much less the chalkboard--was when the staff was having an early dinner. Moreover, I have heard some unbelievable requests, from requesting a sweeter pad thai to requests for Chinese food like egg rolls and the like. Face it: the neighborhood thinks it's a typical "Rice and Noodles" joint and treats it as such. The foodies are clearly a niche group for them. But I'm curious how the crispy on choy's sales were affected by the migration to the regular menu. Crispy On Choy was on the special's board, not the "secret" menu. I'm not sure you'd learn anything. I was there two weeks ago and it was on the regular menu. I just caught the TAC commentary on Check Please. I haven't been to TAC in a while, so maybe things changed without my awareness. The Chef-Owner who provided the narrative, his name quickly flashed on the screen. He didn't seem familiar and the streaming audio had no names to verify. Is this Chef Andy Aroonrasameruang? When I last saw him, I thought he had very closely trimmed to no hair. The chef-owner had a full head of hair. Is this Andy or someone else? I am not familiar with the owner that was interviewed, but there was a brief shot of Andy cooking in the kitchen. eatchicago wrote: I am not familiar with the owner that was interviewed, but there was a brief shot of Andy cooking in the kitchen. Same observation here, not familiar with the owner that was interviewed, but did see Andy briefly cooking in the kitchen. How about them Crab Rangoon. I don't think that's a fair assessment when you consider that Lao Sze Chuan is situated in an area where Asian Americans are in the majority. Have you seen the Check Please where they visit Lao Sze Chaun? Egg drop soup, sesame chicken, "crispy shrimp", szechuan beef, and empress chicken. I'm sure I sound like a bit of a snob, but those are the kinds of request I hear from people at Tac Quick all the time. I don't know, we had these amazing snail-y sort of seafood-y things at TAC. They were on the specials board. We asked what they were, the waiter talked it over with us, and explained carefully. They were very tasty, though I wouldn't order them again because they were VERY sandy. Beautiful conch-like shells, the animals inside were about the size of your thumb. Sort of the same texture as Octopus - firm, but not chewy or gummy. I think they were oven-roasted. A seasonal item, I believe. 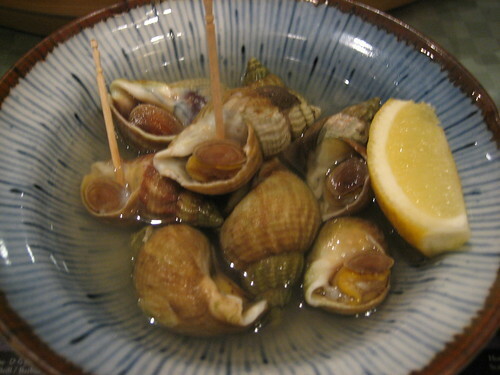 leek wrote: I don't know, we had these amazing snail-y sort of seafood-y things at TAC. They were on the specials board. We asked what they were, the waiter talked it over with us, and explained carefully. They were very tasty, though I wouldn't order them again because they were VERY sandy. Beautiful conch-like shells, the animals inside were about the size of your thumb. Sort of the same texture as Octopus - firm, but not chewy or gummy. I think they were oven-roasted. A seasonal item, I believe. leek wrote: ...we had these amazing snail-y sort of seafood-y things at TAC. ...[snip] Beautiful conch-like shells, the animals inside were about the size of your thumb. Sort of the same texture as Octopus - firm, but not chewy or gummy. I think they were oven-roasted. A seasonal item, I believe. Maybe whelks. The shell seemed smoother, though, less textured than that picture.